In the same year that Wesley Chu wraps up one rollicking SF thriller series, the excellent Tao trilogy, he kicks off another one with many of the same strengths: a well thought-out alternate timeline, visceral combat, strong characterization, and a healthy sense of humor. Time Salvager follows James Griffin-Mars, a chronman as gruff as his name, who travels back in time for ChronoCom to salvage resources from the past for the rundown, barely-hanging-on future. Over the years, he’s left countless people to die in horrible tragedies because that was their fate, and he could not change it. Then on his One Last Job, he takes a liking to Elise Kim, a scientist as lovely as her name, and in a moment of weakness, he saves her life. Bringing back someone from the past is very, very illegal. James and Elise go on the run and into hiding, pursued by Levin Javier-Oberon, an auditor as circumspect as his name, who corrects anomalies in the chronostream. Levin, though the ostensible antagonist, might be my favorite character in the book; through him, we get a glimpse at the inner workings of ChronoCom and the hints that it may not be all it’s cracked up to be, which makes for a conflicted “villain.” Elise, despite being saved by James, proves to be quite independent, actively annoyed by James’s overprotectiveness, and I loved her scientific curiosity and out-of-date twenty-first-century references. James is clearly the coolest character in the book because he’s the one who travels through time and wears thought-controlled wristbands that allow him to breathe in space and fight with energy coils that burst out of him like Doc Ock’s tentacles . . . but he’s not the most likable guy, and his major conflict — guilt for the people he’s failed to save, specifically his kid sister — hit the same note over and over. It’s a good basis for a character arc, but it felt forced to me, and I didn’t connect to it. It does, however, pay off in a fantastic way. 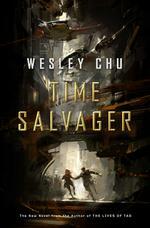 I know time travel has been done to death, but Time Salvager feels like a fresh spin on old tropes, thanks to Chu’s fairly simple setup — changing time causes ripples but the timeline will self-correct — that keeps the focus on what he’s really bringing to the table, which is a richly imagined future where humanity reached utopia only to ruin the Earth in the end after all. Thus, unlike a lot of time travel stories, the “past” James travels to is often our own future, which keeps the book from treading well-trodden ground too much. Time Salvager starts off with a doomed spaceship and never slows down. Chapters frequently end on cutting, powerful lines and plot twists occasionally made me shout, “Oh my God! Oh my God!” at the book. It’s a fun thriller with real weight behind its ideas, and a promising start for a new series. The Fifth Season begins with the end of the world, one of many bold choices N.K. Jemisin makes in this incredible book. But this is not your Michael Bay apocalypse, oh no: It focuses on a personal apocalypse, a mother cradling her dead son in the wake of immense destruction. The Stillness is a seismically unstable land that has withstood cycles of destruction throughout the centuries, but this may very well be the final one. In a hell of a prologue, an unidentified narrator — Jemisin is one of the best around when it comes to engaging narrators — lays out the world for the reader and highlights key figures whose identities will not be clear until much later. I returned to the prologue several times as I learned more, and each time my comprehension deepened. Although there’s the occasional exposition, most of the worldbuilding is delivered entirely through context, and the world depicted in the prologue slowly crystallizes as fully realized. Massive shakes. Godlike beings made of stone. Mysterious floating obelisks. 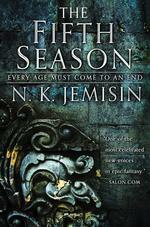 After the prologue, Jemisin splits the narrative between three characters. Damaya, a young orogene — with the power to quell and harness seismic energy — given up by her parents to go learn at Xavier’s School for Gifted Orogenes. Syenite, an experienced orogene chosen for an important assignment. Essun, a grieving mother searching for vengeance and her daughter. It’s not quite maiden-mother-crone, but it has that vibe, showing women at different stages of life, how each one deals with her powers. I found it hardest to connect with Essun — the apparent main character, as we begin the book with her — because her story is told in second-person, which I love but has a distancing effect, appropriate for a character who has had her entire world shattered. I always love child characters, so even though Damaya’s school adventures are somewhat trope-y, she was very endearing. Syenite was my favorite, as she felt the most confident and lively, with an entertaining wryness to her voice; she also gets the most time onscreen. There’s something to love in all three disparate stories (young adult magic school antics, magical romance adventure, post-apocalyptic road trip), and each adds more and more to our understanding of the world. While the fantastical elements of The Fifth Season are stunning and well-constructed themselves, it’s the real-world parallels that make the book an even more searing read. While it’s certainly not a new idea to use mutants as a metaphor for prejudice and oppression, Jemisin does it as I’ve never seen before, such that every mention of how orogenes are treated called up a new story in my mind, though it’s not clumsily done. She invents a racial slur I can’t even bring myself to type because this fictional slur feels so nasty to me, and she examines the ways in which slurs can be reclaimed, and how even then, they can still have power in either direction. Make no mistake: This is an angry book. But it also has chapter titles like “you’re getting the band back together” and “Syenite breaks her toys,” so it’s not without a sense of lightness. My feelings on The Fifth Season changed as I read, but it is a book that imbues itself with deeper meaning the more it unfolds and reveals itself, and by the end, I saw everything in a new light. I knew Jemisin was talented, being a huge fan of her Inheritance and Dreamblood books, but here she employs heretofore unseen skills. Unlike those books, however, the books in this trilogy are not self-contained, and this first book ends on a note that will have me stamping my foot until the earth cracks for the next one. For decades, the Islands of Dara have been under imperial rule, the Reign of One Bright Heaven. As so often happens throughout history, however, empire leads to rebellion, and suddenly the Tiro states find themselves in a bloody power struggle, with two men emerging as key figures: the eight-foot-tall warrior Mata Zyndu and the cunning bandit Kuni Garu. 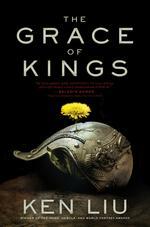 To attempt to summarize The Grace of Kings would be folly, as so much happens in this first book of a trilogy that it could be a trilogy all on its own. Ken Liu accomplishes this dense storytelling without making the narrative feel rushed or rote by constantly changing scope: A section that covers weeks of battle in which tens of thousands of people die is followed by an intimate conversation between a king and his counsel. This is an epic poem in novel form, a story in which gods banter about the fates of mortals (and may or may not intervene), in which the tender relationship between a man and his wife holds just as much weight as an incredible military maneuver, in which characters are casually beheaded in the middle of paragraphs. While much of the book feels like a giant game of Risk where I lost track of what state was under whose rule, Liu frequently dazzles with his “silkpunk” ingenuity, devising creative technology out of the raw materials available to this ancient culture, everything from smart bombs to parachutes. So much of the battles involve trickery that even if the actual tactics went over my head, the battles themselves were such a thrill I even found myself giving props to the “bad” guy, if there can be said to be a “bad” guy in a story where every man in power stays in power by killing lots of people. The book is absolutely aware of the traditions it’s following, and I loved the occasional cheeky (black) humor about the human cost of maintaining power. True to those epic traditions, unfortunately, men drive the narrative, with very few women playing a role for most of the novel. In the last third, however, women become more prominent; one female character almost single-handedly makes up for the relative lack of women before. Given the explicit discussions of sexism, I understood that it was a deliberate choice in the narrative, and I can see potential for more focus on the women in the rest of the trilogy, but I still found it frustrating in this book. Ken Liu, prolific, award-winning short story writer, has burst onto the novel scene with a rare beast of a book, an epic fantasy like no other. The Grace of Kings delivers an impressive, unique reading experience, a tale spanning years told with the care of a master storyteller. Sierra Santiago knows something weird is going on when she sees a mural crying. Then her grandfather starts talking about shadowshapers, and faster than you can say, “Yer a wizard, Sierra!” she’s off on a dangerous adventure of magical art and spiritual energy to protect everyone she loves. Shadowshaper structures Sierra’s coming-of-age story around an investigation, as she tries to find out more about shadowshapers and decipher her grandfather’s riddles. Not only does she get magic lessons from a hot guy, but she also goes to the college library to do actual research, reading the notes of a white anthropologist who had been studying shadowshapers. Thus, the first half of the book feels like Sierra is on a quest for exposition, but Daniel José Older keeps things interesting with occasional attacks from the walking dead and the spiritual dead (as in Half-Resurrection Blues, much of the supernatural aspects revolve around the dead). The second half has much more momentum, as Sierra has gathered enough information to really move against her adversary. Sierra’s story is multigenerational, and her heritage plays a large part in her power. 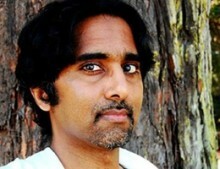 Characters are black and Latino, but they’re not generic; each one is proud of their ancestry, where they come from. I’ve never read a book that so explicitly and yet casually acknowledged how complex our cultural and personal identities are. Sierra’s friends and other neighborhood regulars form a tight-knit community, as family to her as any blood relatives. Shadowshaping isn’t just another magic system but a way of channeling that culture, the spirits of everyone that came before you, into your art, giving it life. But making artwork come alive is only the tip of the iceberg. The walking dead and spiritual dead manifest in terrifying ways, their scenes adding true chilling horror to the book. These creatures drive the action scenes, which are kinetic and experiential; I was reading so quickly that I couldn’t put together all the details of motion but I still had images in my mind. The climactic scene, a chaotic, thrilling affair, provides a good payoff for everything it’s taken to get there. Shadowshaper wastes no time in getting down to business and moves forward at a fast pace, whether Sierra is tracking down information or battling haunts. She’s a winning, driven heroine, who isn’t afraid to stand up for herself but also isn’t above accepting the help of her friends, especially when facing such a formidable foe. The villain of this book is basically cultural appropriation, a man who thinks he is honoring Sierra’s culture when in fact he’s harming it. 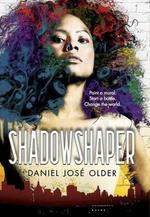 Shadowshaper makes the powerful statement that our culture, our traditions, and our history are worth fighting for.